Set in the snowy wilderness of Northern Canada, The Wolves of Winter follows Gwendolynn McBride (Lynn, if you please), a young woman who, along with her family, escaped the United States after both nuclear war and a deadly flu virus ravaged her homeland. The McBrides have been leading a minimalist existence under the radar until a mysterious man arrives on their proverbial doorstep. Who is he running from? Will he threaten the McBrides’ way of life? I’ll be the first to admit that I nearly gave up on this one within the first fifty pages. The story was interesting enough (I’m a sucker for most things post-apocalyptic), but the problem lay within the narration for Lynn. I found her to be written much younger than her twenty-three years, to the point where it was a distraction from the overall story. However, as the story moved along, she seemed to settle down as the overall seriousness of the story commanded a more grounded tone. Once the stakes had risen and the characters’ actions required a deeper sense of urgency, this one became a real page-turner. I was home sick from work when I picked this one up in the morning and devoured the whole book in one day. The heavy focus on action and snappy dialogue made this an easily digestible story. To be honest, I was skeptical that you would be able to find anywhere that would be a good place to hide out following a nuclear war, but after doing some additional online research, the Yukon holds up surprisingly well. I didn’t exactly doubt the author, it had more to do with my skeptical nature. Author Tyrell Johnson does a great job painting the picture of the harsh frozen landscape and the dire lifestyle of its inhabitants. My biggest complaint involves the ending. I would have preferred things not be wrapped up so neatly as I found the author stretched believability a little too far and didn’t quite take enough chances. People can take disappointment! It’s an end-of-the-world novel, after all. 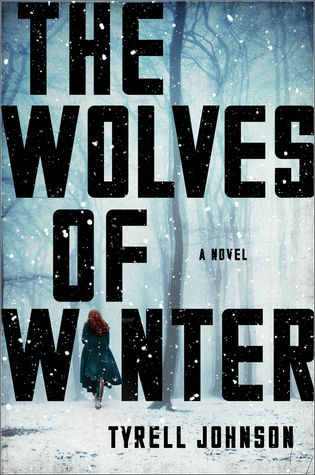 That being said, The Wolves of Winter is impressive work for a first time novelist. Johnson paces the novel exceptionally well, crafting a thrilling, albeit swift read. I believe he will continue to grow and develop as he produces more work as time goes on.